Moderate consumption of alcohol may have some health benefits, with some types of alcoholic beverages, including cognac, possibly having more beneficial effects than others. However, drinking too much alcohol of any kind can increase certain health risks. Antioxidants are beneficial substances that help keep harmful free radicals from damaging your cells. This type of damage can increase your risk for clogged arteries, heart disease, cancer and vision loss. Drinking moderate doses of cognac may help increase the amount of antioxidants your blood can absorb, according to a study published in "Cardiovascular Ultrasound" in 2008. 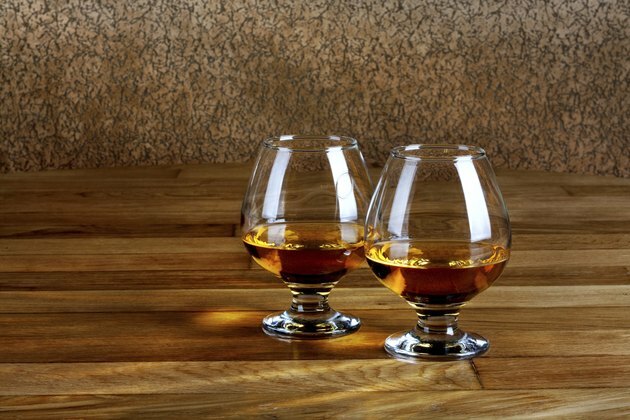 Cognac may help limit your risk for blood clots. An animal study published in "Physiology Research" in 2008 found that certain compounds in cognac may help keep blood cells from clumping together and limit the amount of work the heart needs to do, potentially lowering your risk for heart disease. Alcohol in general has a protective effect against heart disease, stroke and high blood pressure, but only when consumed in moderate amounts, according to the Harvard School of Public Health. Heart health isn't the only potential area in which drinking cognac or another alcoholic beverage may be beneficial. Drinking alcohol may also help limit your risk for Type 2 diabetes and gallstones, as long as you drink only a moderate amount, notes the HSPH. Anything more than moderate consumption, or one drink per day for women and two drinks per day for men, may actually increase your risk for cancer, heart disease and liver disease, according to the HSPH. An article published in "Alcohol Research & Health" notes that the lowest overall risk is associated with an average daily intake of no more than 10 grams of alcohol, which is less than one drink. Drinking just 20 grams of alcohol per day, which is between one and two drinks, increases the risk for premature death compared to drinking no alcohol.